My camera is still out of commission. Now it's the charger. I can't find it anywhere (I have a feeling it's at Kaely's dad's house, but that's a whole 'nother story)! I have one on order, though, so soon I will have my very own wonderful, top-notch, professional quality pictures up. Well, I'll have pictures anyway. Fortunately for me, my girl friend Janel made these super cute donuts that she said I could show off for you. Arent' they adorable?! They taste good too! I facebooked the link for these snowman cuties from Red Couch Recipes yesterday. She already had the donuts, jimmies, and sprinkles, so she ran out and got some orange slices for noses. For a finders fee I got to sample some. Cute, but not too cute to eat. This weekend Janel and I are going to try making Painted XOXO's ! Janel's got the jig-saw and she's ready to use it. I'm the paint supplier. 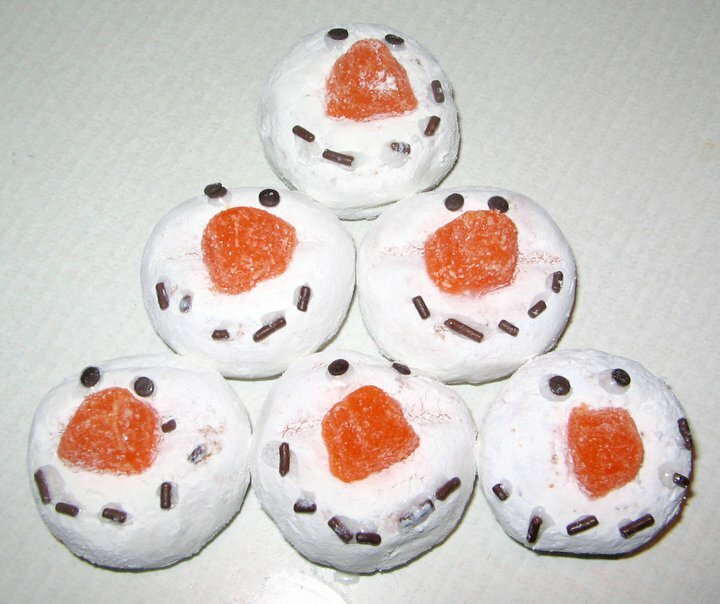 Those snowman doughnuts would be even better with a side of hot chocolate.